Milo had a long over due appointment for a nail trim, but you’d think he was being tortured to death. He screamed like a 4 year old girl. After, Milo and the Vet emerged covered in pee, she was not happy. 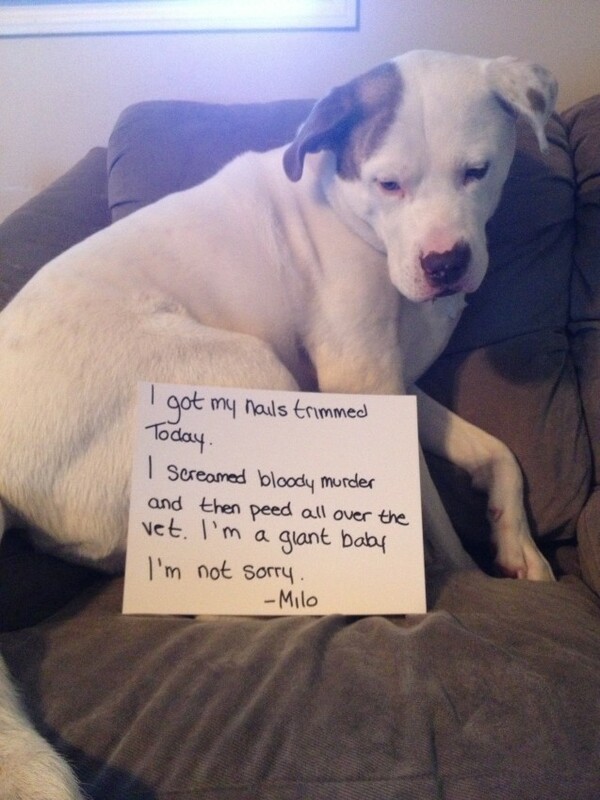 Milo is a 120lbs wuss. Posted January 17th, 2015 . PUPPY IN DISTRESS cut him some slack. He need a dog biscuit, a pat on the head, and an “Its ok boy you are a good dog. My pug JB has to be sedated to get his nails trimmed. He gets completely hysterical. He hasn’t wrapped his doggie brain around clipping and fears what he doesn’t comprehend. Please don’t get mad at him; he can sense it. Having a groomer visit and clip the nails at your home may be less stressful. Progress to the shop or clinic when he is more at ease. Also, the longer the intervals, the more uncomfortable clipping gets. Milo, sorry about the nail trim; maybe it will be a bit less scary next time. You are one beautiful pup. awww. my dog screams also, as soon as the clippers get NEAR him. they don’t even have to touch his paw yet. the other one tries to hide under my chair. never had them pee tho!